Today's content creators and visual artists typically have to deal with a massive flood of digital content. Regardless of whether you're into photography, videography or other types of digital media, with the ongoing war on resolution, there is a constant increase in file size. And while you might start your initial career on a single portable hard drive, you'll most likely run into limitations very quickly. Most people I know in the business, including myself, kept on buying more and more hard drives, slowly blundering into a dead-end street of dealing with back-up problems, lost files and multiple copies of catalogues, assuming you're using Lightroom or something similar. Finally, when one of these drives crashes, you'll find yourself in some real trouble. And let me tell you, I know what I'm talking about here. It's just a couple of weeks ago, when one of my portable hard drives with around 2 Terabyte of content stopped working. It contained images from the last two years, including all the editing and catalogue metadata. Thankfully, I was able to recover all of it from several other drives and a couple of SD cards, which weren't formatted so far. After this frightening incident it was about time to change my workflow. The first idea which came to my mind was buying virtual storage from one of the many cloud providers online. "The Cloud" has been one of the most advertised buzz words for a couple of years now, so I assume you know what I'm talking about. You'll find a lot of different providers like Google Drive or Dropbox. Amazon offers possibilities as well. Some others are more specialized providers with an emphasis on security and so on. Anyways, the obvious advantage of storing your images via a cloud service is, that your files are accessible from everywhere around the world, at least with a connection to the internet. This means, you'll also be able to recover your whole content from this service, in case your house burns down or your hard drives crash (not wishing that to anybody of you). Most providers do a pretty good job on redundancy as well, providing you a 24/7 available service. Well, these services also do come with some noteworthy disadvantages. First, most of us work with big sized files, like RAW or 4K formats. Up to date high-res cameras for example easily produce images with a size of up to 80 Megabyte per file. Crazy right? And it's even worse for those of you shooting video content in 4K. Now let's imagine the time it'll take for uploading those huge files to a cloud storage. Even with a very good broadband connection this might take ages. Second, you will still need a copy of your content on local storages, as programs like Adobe Lightroom can't deal with these remote connections. Furthermore, no matter which provider you'll choose, things get pretty expensive once you have more than 1 TB of content. Some other things like server-sided compression algorithms, questionable locations of the servers and not being able to work without access to the internet, made me back away from this idea very quickly. So, what other solutions could work? You might ask yourself "What the hell is a NAS?". A NAS, or Network Attached Storage, basically is a box or casing, containing a cluster of several hard drives. This box will be attached to your router at home and therefore is accessible from all devices with a connection to the same network. This means you'll have a centralised storage solution for your whole content, without dealing with cables, multiple USB hard drives and so on. Based on the size and price of this NAS, you'll be able to extend the storage, which means it's future-proof as well. Data usually will be stored in a RAID (Redundant Array of Independent Disks), which is a virtualisation of the physical disks into one logical drive, having redundancy as well. Based on the RAID level, you'll be able to restore your data in case one or more of the physical disks will fail. The read/write times of a NAS system are significantly faster than using a cloud service and having a physical device in your local network, makes you independent from a connection to the internet or any service, when working at the same location. With some changes to the settings of your router, it'll be available from outside as well. This means you can access the system while travelling for example. This offers whole new possibilities and because NAS systems are designed to run without downtime, you don't have to worry about switching it on and off at all. All this sounds very promising so far, right? Unfortunately, these systems usually come with some drawbacks as well. While the RAID approach might safe you from disk failures, it's worth nothing if the whole house goes up in smoke and fire. Once again, this would result in a total loss of your data. Backing it up on a portable drive and storing it off-site would add more safety, but sounds cumbersome and time-consuming. Also, connecting it to your network makes your data vulnerable for cyber attacks and malware, so you have to take care of security on your own. Without any technical background in IT, this sounds like a pretty tough job, right? There are some more disadvantages, but I guess you get my point here: None of these two approaches I mentioned would give you enough safety and flexibility at the same time. Thankfully, my friends over at Synology hooked me up with a device, which promises to get rid of all these problems. Synology Inc. is a class-leading expert in the industry of NAS and cloud solutions, supporting all kind of content management scenarios. After talking with them about my current workflow, what I'd like to change and what expectations I have, they recommended me the DiskStation DS1517+. A solution, which should tackle all of my pain points. They were kind enough to send over a test product, making it possible to write these upcoming tutorials for you guys. The DS1517+ is a 5-bay NAS (Synology calls them DiskStations) powered by a quad-core CPU with up to 16GB of DDR3 RAM. The device is able to operate 5 hard drives simultaneously, up to a total of 60TB (5 x 12TB). And if that's still not enough, you can attach expansion units for a max of a 180TB (15 x12TB). The device offers 5 lockable drive bays on the front, for which a key is included in the package. This prevents users from accidentally pulling out drives in operation. You'll also find a power button on top and several LED lights, which inform you about the overall status and connections of the device. Turning the device around, you'll be pleased with plenty of opportunities to connect devices and to integrate the DiskStation in your local environment. The DS1517+ offers 4 USB 3.0 Ports, of which one is on the front for an easy connection of portable drives. Furthermore, there're 4 LAN ports with Link Aggregation and Failover Support, 2 eSATA ports and a PCIe expansion slot. Having this PCIe slot, a user is able to plug in a 10GbE network interface or a dual M.2 SSD adapter card, for boosting up network speed or SSD caching. Two big fans round up the back of the device, for keeping the interior elements cool at all times. The best NAS system is worth nothing, without professional hard drives, built with a strong focus on reliability and speed. Making wrong choices here often leads to a bottleneck for the overall system. NAS drives usually have to deal with a vast number of read/write operations from multiple users at the same time, while running 24/7 for many years. So you see, these drives are on a whole different level compared to portable USB drives, which usually have a much simpler construction. For the purpose of this test phase, the guys from Seagate provided me with 3 of their IronWolf hard drives, with 10 TB capacity each. These drives are made for being used in NAS systems and offer several features for a high scalability and the handling of massive workloads. Seagate put a lot of effort in the architecture of these drives. They come with a feature called Agile-Array-Technology. This technology enables high performance in multi-user environments and ensures the drives can handle high-end workload rates in high data traffic networks. They're equipped with sensors, to reduce vibration in a multi-bay-enclosure and come with IronWolf Health Management features, which enable a higher level of health reporting, when used together with Synology systems. These features display actionable prevention, intervention or recovery options for the user. With a total of 30 TB, I am able to store my whole business related content to the device, still having two empty slots for expanding to 60 TB in the future. A pretty solid starting point if you ask me. Now what makes the Synology devices really special and sets them apart from the competition, is Synology's in-house developed software called DSM, which runs on each of their NAS solutions. The DSM (or DiskStation Manager) is an intuitive web-based operating system, which manages each functionality of the device and supports you with your digital content workflow. It is highly customizable and you'll find plenty of expansion packages to cover all of your needs. 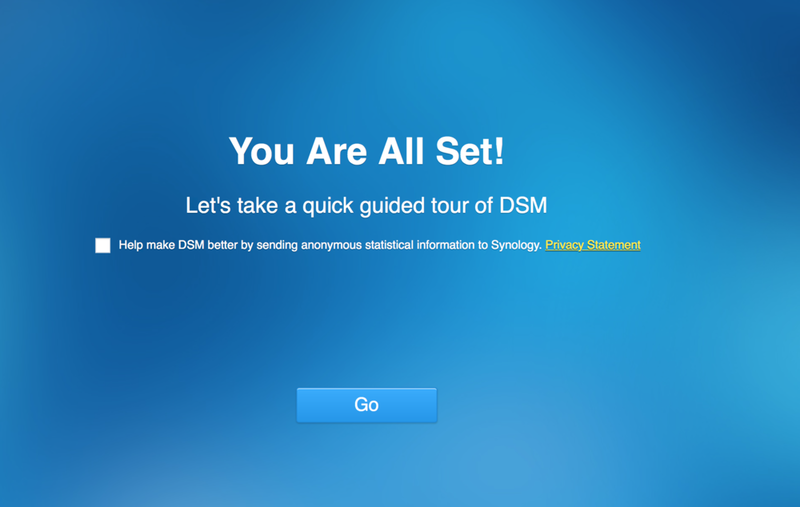 Right after logging in with a valid user, you'll find yourself on the DSM Desktop. Based on your user's rights and the customization, there are several applications, so called packages, available. The Control Panel for example offers you plenty of possibilities to customize the behaviour and overall environment of the system. As you can see on the screenshot above, there're options for user management, file sharing, power management, network options and many more. The possibilities are endless and you won't miss anything here. The DSM offers a set of widgets as well, which inform users about system health, other logged in accounts, scheduled tasks and much more. You can see the widget bar on the right on the screenshot above. Next to these basic functionalities, you are able to install additional packages via the Package Center application. Think of the Package Center as a comprehensive pool of applications, which allow you to extend the functionality of your Synology DiskStation in so many ways you might have never thought about. When opening the Center, you'll see an overview of already installed packages. Right below there is the Explore tab, which divides the packages by genre. The Recommended tab is a good starting point for everyone who's setting up the device for the first time. It gives you a nice overview of some of the most popular packages. Here you'll find things like different media stations, which transform your DiskStation in a multimedia server for streaming content on your computer or mobile devices. Next to these packages, you will find a lot of other options to share and synchronise files with other devices, to backup on portable hard drives, other DiskStations or even cloud services. In fact, you can host multiple virtual machines on the device as well. It would take ages to name all the possibilities. A whole overview of the packages is available here. And you might have noticed it already: With the DS1517+ I'm actually able to get the benefits of a NAS and cloud services in one single device. While I'll manage my overall content on the DiskStation at home, I'll be able to connect the device to a cloud service of my choice. Synology offers an own solution called Synology Cloud² (C2). With only a small fee, you will be enjoying the advantages of scheduled backups, multi-version support, and granular restoration at file level to any operating system, including DSM. Of course you'll be able to connect other service providers as well, including Dropbox, Google Drive and to name a few. All you have to do is logging into your service account, specifying the content and a scheduled task and the DS1517+ will take care of everything from that point on. Basically this means you'll always have a version of your most important content, either at home or off-site in the cloud. I'm going to show you how to achieve this in a following tutorial, so stay tuned for that. Especially when you're on your way becoming a professional, dealing with tight schedules and clients, a solution like this will safe you from many sleepless nights and in case of a crash it'll also safe the existence of your business. Alright, I know we have already covered a lot of topics here and it might have sounded complicated for some of you. One could imagine it takes a lot of time and effort to get the system up and running. So how easy is it really to set all this up? Well, let me tell you right away: It's as easy as pie! Once you put the hard drives into the slides (not a single screw needed here), you push them back into the bays of the DS1517+. No cables, nothing. Connect the device to the power outlet and a free LAN port on your router, hit the power button on the front and the DiskStation starts booting up. Note: Some of the following screenshots contain blacked out areas, due to security reasons. 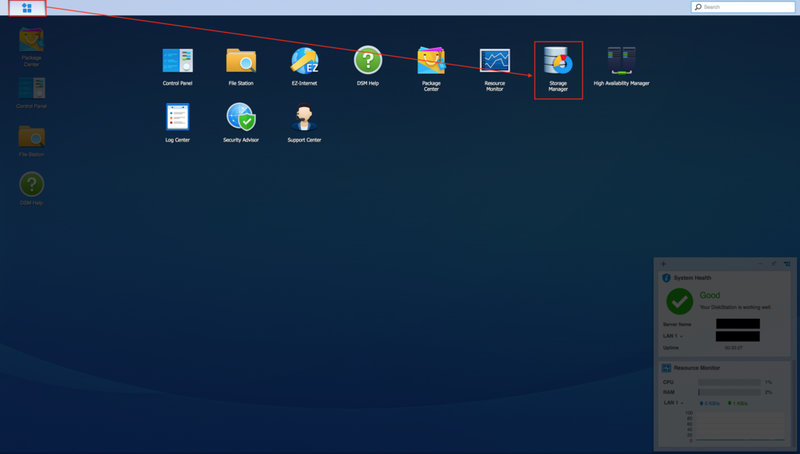 Next you open your browser and type in find.synology.com, which starts a search functionality within your local network to locate the connected DiskStation. It only takes a few seconds for your DS1517+ to be found on the local network and you're only one click away to connect to it. After that, click again for starting the setup process. With starting the device for the first time, you have to confirm the installation of the DSM operating system. Click on the Install Now button and accept the formatting of the drives on the following screen. After that you'll see a progress indicator for the DSM installation. It takes a few minutes only and once completed, the device will reboot. Once the DiskStation reboot is completed, you'll be asked to create an administrator account and a device name. Please provide the necessary information and proceed. On the next screen, please configure your settings for update cycles and S.M.A.R.T health tests for the installed drives. No worries, you'll be able to change all these settings in the Control Panel later on but I think it's quite handy to set them right away. This makes sure your DSM is always up to date and that you'll receive information in case something is wrong with your hard drives. Hitting the NEXT button leads you to the QuickConnect screen. QuickConnect allows you to reach your DiskStation from outside via the internet, without the hassle of setting up port forwarding rules and other settings on your router device. Setting this up makes it possible to access your content from everywhere, even with Synology apps on your mobile devices. After providing the information, you'll receive a customized URL, which from now on can be used to reach your DiskStation. And that's basically it. You just managed to set up your brand new Synology DS1517+ (or any other Synology DiskStation) in a couple of minutes and with only a hand-full of clicks. Once you logged in with your previously created administrator credentials, you will be forwarded to the initial desktop screen of the DSM. For all of you being new to the DSM operating system, Synology offers a nice pre-installed package DSM Help. It's a huge knowledge database of information related to DSM. You can type in your search query, whenever you need some help on a topic. Synology did a very good job on this, so make sure to give it a try. Last but not least, I'd like to show you some crucial settings you shouldn't miss before going productive with any DiskStation. 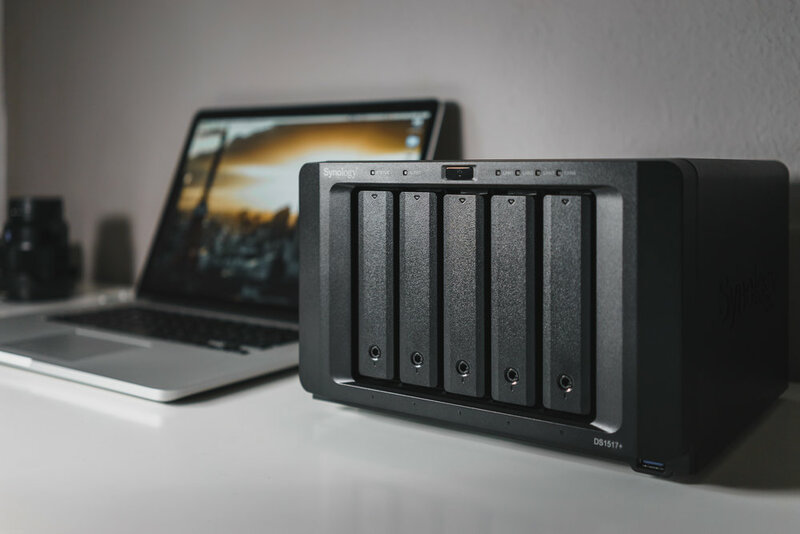 These tips include some initial steps for the file system and things about how to add some extra security to your Synology device. First thing you should do before really using your DiskStation is disabling the default admin account. By default, the DSM administrator account is admin with a blank password. Obviously, these details can be easily guessed by malicious parties, trying to hack into your Synology device. To do this, you should first log into DSM with an account, which is already part of the administrators group. For example with the default admin account. Here you should be able to see the user account you have already set up during the initial installation process of your DiskStation. Click on this user account and hit the Edit button on top of the window. 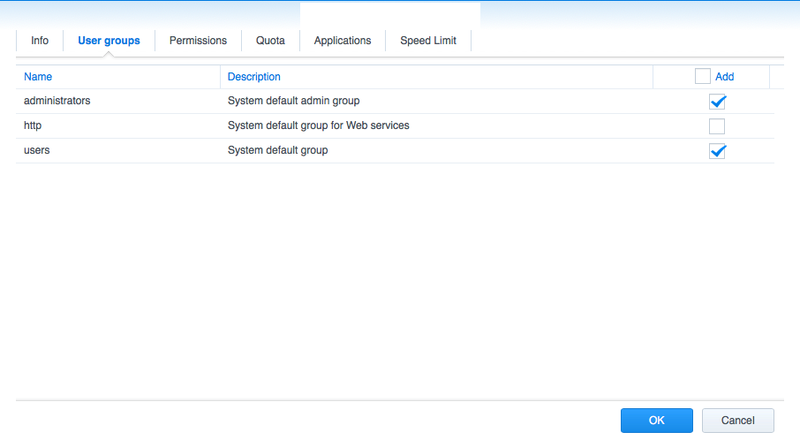 After the new window popped up, switch to the User groups panel and enable the checkbox for the administrators group. Press OK to save your changes. This account is now your new administrator account. Log off from the system and log in again with the account you've added to the admin group a minute ago. Now once again, go to Main Menu > Control Panel > User. This time mark the default admin account and hit the Edit button on top. On the Info tab enable the Disable this account checkbox, also check Immediatly. Hit the OK button to accept the changes. Congratulations, you have successfully disabled the default admin account, which makes your system a lot safer. For each individual account, you can also set permissions to specific folders or speed and capacity restrictions, but this might be tackled in an upcoming blog post. Obviously, there is much more you can do, to really make your DiskStation bullet-proof against attacks from the outside. Things like HTTPS connections, 2-step verification and so on can be setup with a few clicks only. This post is already getting really long though, hence you'll find further information here. Another important step, before you can start managing content on the DiskStation, is to create one or more volumes. Some of you might know them as partitions. A volume or a partition is a logical block on one ore more physical drive. Having multiple volumes on a physical drive can have several organisational benefits, but most of us will be fine with a single volume. So for the sake of it, I'll show you how to create this volume. Open the Storage Manage and go to the Volume Tab. Hit the Create button for the Volume Creation Wizard to pop up. Here I suggest you to choose Quick, except you're an IT professional knowing exactly what to customize in terms of RAID levels and so on. This option will create a volume using the Synology Hybrid Raid (SHR). SHR is an automated RAID management system that makes storage volume deployment easier than with traditional RAID systems. It'll help you to get the most out of your capacity and makes it a breeze to expand your storage by new drives in the future. It also allows for 1-disk or 2-disk worth of redundancy, based on the number of installed drives in your DiskStation. This means that a technical failure or lost of one or two drives has no effect on the availability of your content. Hit the Next button, select the drives you want to include in this volume and confirm the formatting. In the next step you have to decide for an appropriate file system and find a description for your new volume. To get the most out of the DiskStation's features, like shared folder snapshots and advanced data integrity protection, it's recommended to choose Btrfs as a file system. Press Next and enter a volume description or adopt the pre-filled value. Again, press Next to accept the changes. We made it! The new volume is created and we can finally start creating folders and storing content on the DiskStation. The possibilities you have here and how to integrate your DiskStation into an post processing environment will be addressed in the upcoming blog post The Synology DS1517+: Integration into my photography workflow. I'll split this topic up into several parts, showing my personal setup for the Synology DS1517+, for realising gapless backups, working with Adobe Lightroom and publishing content to clients. Stay tuned for this and thanks a lot for following along. While travelling and exploring, there's a lot going on behind the scenes until the actual picture is taken and processed. Here you’ll find detailed insights about my photography workflow, the gear I use and places I travel to.